(Photo credit: Sumio Yamada) By Dan Ambrose: Golden Boy Promotions president Oscar De La Hoya says that former WBA/WBC junior middleweight champion Saul “Canelo” Alvarez (44-1-1, 31 KOs) will wind up facing each other, according to Dan Rafael of ESPN. Just when they’ll face each other is anyone’s guess. It might not be a great fight if Canelo gets whipped by WBC middleweight champion Miguel Cotto first in their proposed fight next year in May. Once the red-haired Canelo has been beaten for the second time, it’ll no longer be nearly as interesting for Golovkin to fight him. That’s why it’s better that the Canelo-Golovkin fight take place now before someone else beats Canelo. It’s bad enough that Canelo has struggled to beat Austin Trout and Erislandy Lara by controversial decisions. Those performances, as well as Canelo’s horrible fight against Floyd Mayweather Jr, has been a huge hit to Canelo’s popularity with many boxing fans. “Quote from Oscar DeLa Hoya to me on the phone a little while ago: ‘I have no doubt that Canelo will fight GGG,’” Rafael said on his twitter. Ideally, the best time for Canelo and Golovkin to fight is next year in September if Canelo doesn’t get knocked out by Cotto next May. If Canelo loses that fight, then it makes no sense for Golovkin to waste his time fighting him. If Cotto chooses not to fight Golovkin after beating Canelo then Golovkin will need to focus on taking the WBC middleweight title when/if the World Boxing Council strips Cotto for failing to defend his title against Golovkin. Canelo vs. Golovkin next September will be the perfect fight if Canelo gets past Cotto. There won’t be anyone for Canelo to fight other than Golovkin. He’s already fought Mayweather, and a rematch between them won’t make sense given how one-sided their fight was. That leaves just Golovkin for Canelo. Golovkin said he’s interested in Canelo in the near future, although he prefers to fight Cotto right now. 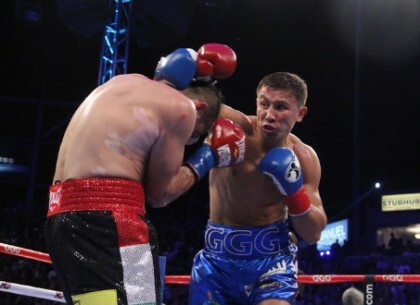 Golovkin said that Canelo is a “Good boy” last Saturday night after Golovkin’s 2nd round knockout win over Marco Antonio Rubio at the StubHub Center in Carson, California. But if Canelo can beat Cotto then Golovkin will turn his attention from Cotto to Canelo and look to fight him for the WBC 160 pound title.